Germany's largest island - its sandy beaches, chalk cliffs, charming architecture and poplar trees helped make it a favourite Baltic pleasure spot during the 19th and 20th centuries. It even has its own national park, Jasmund, so the interior, fringed by that long coastline, is both lush and protected. The best places to stay in Rugen are great bases to enjoy all the fabulous outdoor life that this charming island has to offer. As well as being a haven for outdoor sports - Rügen offers all sorts of land-based activities, from golf to climbing, canoeing to hot air ballooning and possibly every water-based activity you can imagine, even diving. Rügen is home to some sights of historic interest, including Prora, where the Nazis were planning to make the world's largest holiday camp. Make the most of the incredible scenery with a stroll through some of the stunning natural landscapes. The chalk cliffs at Kreidefelsen are majestic and some of the best views are from a boat out at sea. Or kick back and relax at one of the gorgeous beaches. Strand von Binz beach is renowned for its vast expanses of clean white sand and is spacious even at the peak of summer. The majestic Jagdschloss Granitz is a towering castle set atop a hill with great views across the surrounding land. There's a few ways to get up to the castle, but one of the most interesting is taking the steam train then walking. Alternatively, for a different historical experience, visitors may wish to visit the U-Boat museum or Prora, both offering glimpses back in time to Nazi Germany. Or for something a bit different, visit Stortebecker Festspiele and watch a play! As you can imagine the best places to stay in Rugen get booked up well in advance during the summer season (this is the equivalent to Brighton beach for Berliners), so plan ahead and book early. 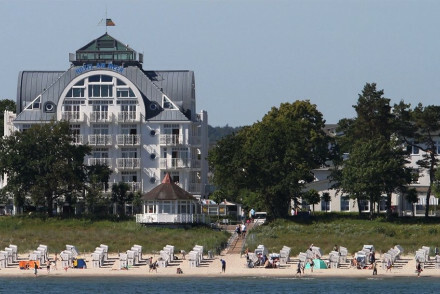 The Hotel Am Meer & Spa is a comfortable hotel in Binz, right on Germany's Baltic Coast. Four stars worth of interesting architecture, right on the beach. This is a great spot for families, with its choice of rooms, suites and apartments. 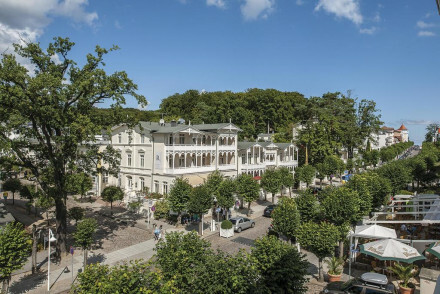 NiXe Hotel is a charming hotel located right on the beach in Binz. The rooms are modern and sleek, focusing on maximising guests relaxation and comfort. Perfectly positioned for a stroll down the beach or just as easily unwind in the niXe spa. A lovely beach holiday destination. 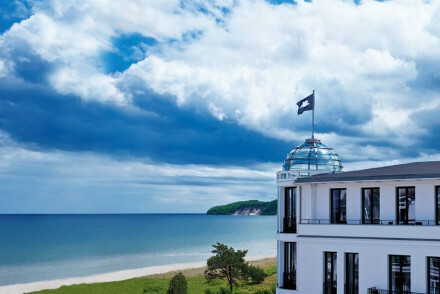 Roewers Privathotel is an attractive 5* hotel on beautiful Rügen Island, with a stunning roof-top pool and superb spa. The 52 elegant rooms and suites are tastefully decked out in summer colours. Find four restaurants onsite, one with gourmet food. Perfect for families, hikers, cyclists and nature lovers. Hotel Ceres is a designer 5* hotel on the beach. Interiors are chic with large French windows, smoked-oak wood parquet floors, opulent bathrooms and linen furnishings. Fantastic gourmet menus and a romantic bar. Ideal for a different kind of beach break on this unusual German island. If you'd prefer a self-catering option this holiday, don't hesitate to visit our online partner Booking.com for a great selection of properties to suit holidays of all types. Fly to Rostock–Laage Airport located 140km (86 miles) from Rugen with a range of flights across Germany and Europe. Alternatively, catch a train to Rugen with various regional train routes along with long-distance connections. There are also ferry links from Sassnitz. If you want to rent a car to explore the stunning island scenery, we recommend visiting our partner Rentalcars. Best time to visit - the summer months from June to September, ideal for exploring the great outdoors or relaxing on the beaches. Charming hotel located right on the beach in Binz. The rooms are modern and sleek, focusing on maximising guests relaxation and comfort. Perfectly positioned for a stroll down the beach or just as easily unwind in the niXe spa. A lovely beach holiday destination. Sights nearby - Explore the deserted Prora Holiday Camp, an eerie remnant of Nazi Germany built by Hitler in the 1930s. Great walks - Take great walks along the beautiful Binz beaches. 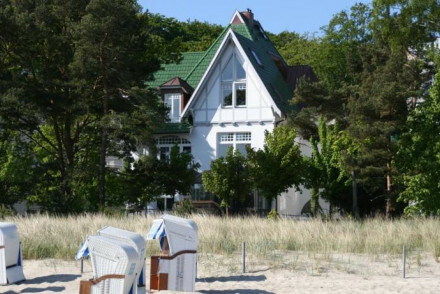 A good four star option on the German Baltic Coast. An interesting architectural building set on the beach with an excellent spa and contemporary design rooms, suites, and apartments. International cuisine, family friendly accommodation, all the mod cons. Ideal for a family beach holiday. Attractive 5* hotel on beautiful Rügen Island, with a stunning roof-top pool and superb spa. The 52 elegant rooms and suites are tastefully decked out in summer colours. Four restaurants onsite, one with gourmet food. So much to see and do. Perfect for families, hikers, cyclists, and nature lovers. Designer 5* hotel on the beach. Interiors are chic with large French windows, smoked-oak wood parquet floors, opulent bathrooms and linen furnishings. Indoor pool, spa, saunas. Fantastic gourmet menus and romantic bar. Ideal for a different kind of beach break on this unusual German island.